Here we have a fine counter example to Monday’s meager offering of a sandwich. All the way on the other side of town, nearly a dollar and a half less than what I paid at Caffe Frascati nets me a much more satisfying sandwich. 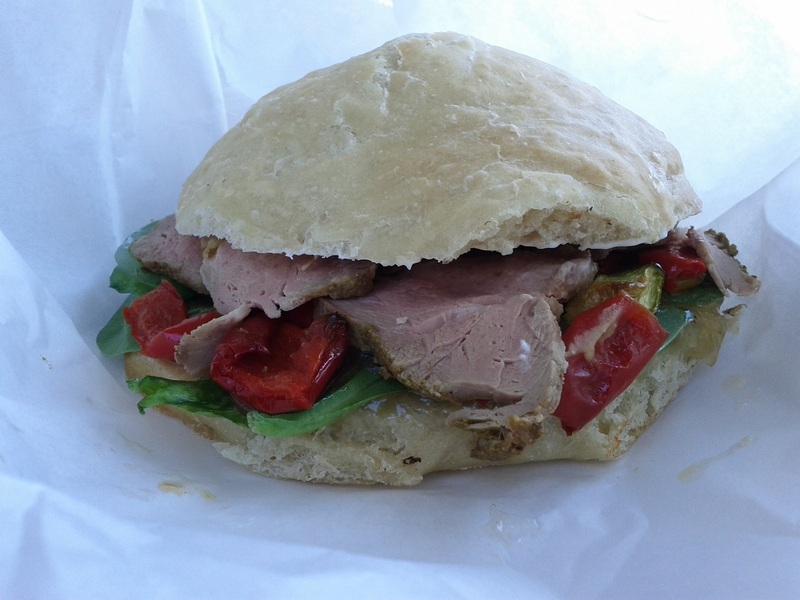 A few hearty slices of cumin spiced roast pork, a house made mango ginger chutney, roasted red peppers, cucumbers and spinach all pile on a white roll and come together quite nicely. This was clearly a sandwich from a coffee bar; it was served cold, and alltogether wasn’t quite everything it could have been. It was also missing the clear freshness that benefited the recent sandwich featured from Coach House, but despite all of that it was still quite good. The pork was well seasoned and tender, the chutney sweet with clear hints of ginger cutting through, the spinach a nice earthy undertone. This was just a good example of what I wish places like Caffe Frascati understood: A good sandwich isn’t hard, you just have to try. A little effort goes a long way, and at Big Word Cafe it went all the way to a delicious sandwich. This entry was posted in Sandwich Reviews and tagged Pork, Reviews by Pete, San Jose, Sandwiches I Have Eaten, Sandwiches Made For Me by Pete. Bookmark the permalink.